Top Venues in Thailand where you can host a destination wedding in BUDGET! A beach wedding on your mind? What better way to mark the beginning of a new journey than by getting married at one of the most beautiful places in this world. The stunning beaches, jaw-dropping landscapes, emerald green water, the friendly people, the unforgettable adventures and many more such elements make us fall head over heels for Thailand. With world-class cuisines and services, Thailand has now become the perfect destination wedding spot. 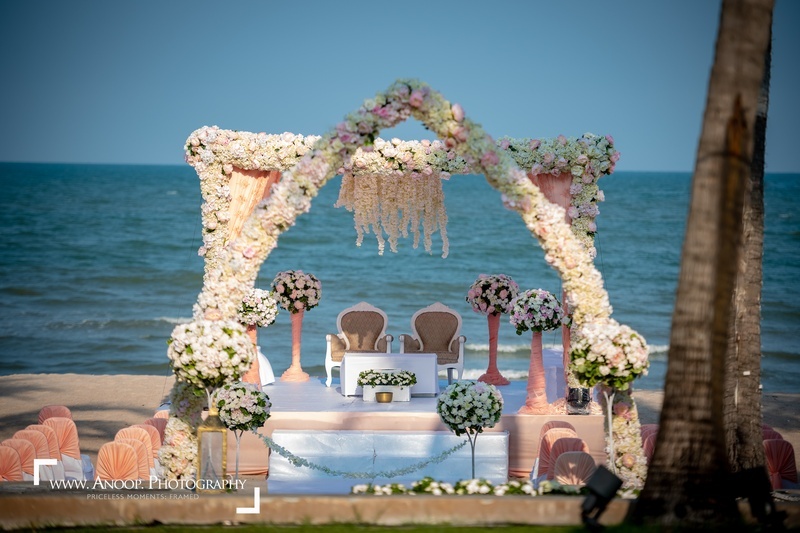 The Palayana Hua Hin is the perfect destination for the dream wedding that you’ve always wanted. A private beach wedding on the white sand and near the cerulean sea, a pre-wedding event amidst the tropical oasis, or a crazy cocktail night by the poolside, even a maddening after-party session at the soundproof Ball Room till the wee hours, you can host it all at The Palayana, Hua Hin. Guests can enjoy a luxurious stay and enjoy their rustic rooms and villas located between the perfect beaches and the green pasture. A dip in the outdoor pool will refresh their senses while the experienced chefs here will take you on a culinary journey of a lifetime. Situated near the hillsides dotted with coconut palms above an attractive bay offering rocky headlands and azure waters, Banyan Tree Samui, Thailand offers excellent facilities for hosting a wedding, straight out of a fairy tale. It is a place where you can set up just the perfect wedding decor near the tranquil oceans and tropical gardens, giving you a feel of a secluded island. With contemporary dining rooms, beautiful spots for post-ceremony cocktails and experienced chefs, Banyan Tree Samui can accommodate the style and size of any wedding that you are planning to host. A small heaven on the Andaman Sea, Kata Rocks is a truly remarkable resort for marking beautiful beginnings of love. With palatial Sky Villas and private swimming pools, it is a sophisticated resort in one of the world’s most romantic beach destinations. Contemporary services and elegant architecture adds to the charm of Kata Rocks and makes it the ultimate Phuket destination. The oceanfront resort is perched on a small cape between Kata and Kata Noi beaches, where you can host a beach wedding that looks the same as the one you have been dreaming about. Amidst the glimmering Andaman Sea and super yachts moored off the pretty island of Koh Pu, the resort offers experiences like never before. Your guests can enjoy fresh oysters, local seafood and tapas that are a few of the house specialties. Soneva Kiri is nestled on the verdant of Koh Kood island amidst nature. This place is surrounded by tropical rainforest and the calming blue water of the Gulf of Siam. It provides an unmatched blend of luxury, environmentally friendly design and unforgettable, authentic Thai experiences. From exclusive wedding ceremony to exclusive cuisines, Soneva provides it all. The hospitable staff takes care of the smallest details, while the specially tailored wedding packages promise luxurious stays and modern amenities to pull up an event that becomes the talk of the town. You can have the entire island and resort buy-outs to ensure complete privacy, providing you and your guests with the ultimate Soneva experience. Awarded as Thailand’s Leading Resort, Intercontinental Hua Hin Resort is a “beach town” known to cater to people with different visualizations. The period architecture, enticing seafood restaurants, bustling markets and colourful nightlife create an exclusive retreat for people who wish to have a quality time out from their mundane life. The pristine beaches, eye-catching temples, world-class golf courses and its hillside vineyards continue to provide an enriching holiday experience to both local and international travellers. A premier seaside community with unrivalled style, sophistication and comfort, the Hua Hin Resort boasts Eastern and Western design heritage. This low-rise beachfront destination makes to our list of top destination wedding venues. With a long stretch of white sandy beach alongside sparkling gulf waters, you get a truly alluring setting for your dream event.